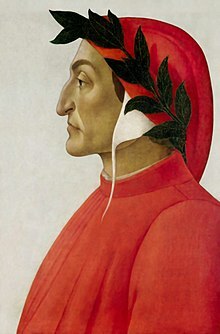 Dante Alighieri, or simply Dante (14 May/13 June 1265 – 14 September 1321), was an Italian poet from Florence. His central work, the Commedia (Divine Comedy), is considered the greatest literary work composed in the Italian language and a masterpiece of world literature. This page was last edited on 31 December 2013, at 11:38.